Like most cricket fans excitedly preparing for the return of international cricket back home, I was also looking forward to going to the National Stadium to watch the final of the Pakistan Super League (PSL), where last year’s champions Peshawar Zalmi were up against the storming Islamabad United. 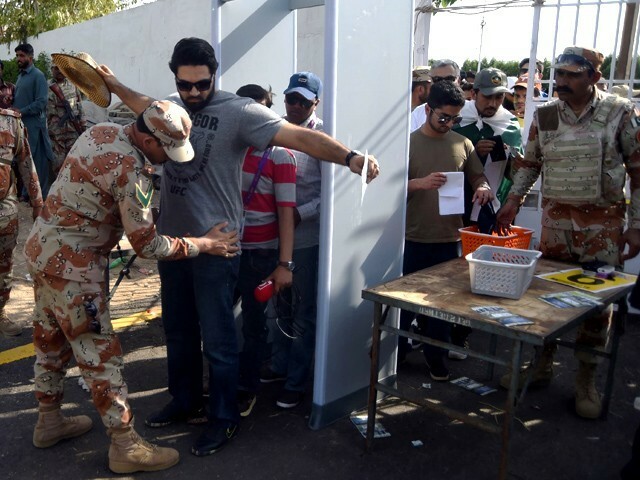 The security was tight, the functioning was strict, and as the Sindh government could not afford any mishaps, they tried their best to pull the edge of each string to ensure no serious problems arose on the big day. This is precisely why each attendee was checked at least three times on their way in. After going through the security measures and having our tickets and CNICs scanned repeatedly, and our pockets checked thoroughly, all of the spectators entered the ground with empty pockets. With only our wallets clad in our hands, we all hoped to find refuge inside the National Stadium. Every item we brought – including Smarties, lip gloss, hand sanitizers, Skittles, cigarettes, lighters, matchboxes, and even baby food – was dispensed and surrendered before we were allowed to enter the stadium. Admittedly, banning cigarettes and lighters at the entrance of the stadium is a smart and routine procedure, and is part of the standard protocol to take away fire hazards like lighters and match boxes. With a capacity of almost 25,000 people, and a tainted past reputation, the government could, after all, take no chances. Thus we sat there, empty handed yet excited, as the ceremony began in full swing. The performances sailed smoothly, with the audience screaming and applauding to get the attention of the likes of Hamza Ali Abbasi, Mahira Khan and Sheheryar Munawar, who were all there to support their team. Celebrities such as Fawad Khan, Farhan Saeed and Shehzad Roy graced the stage to welcome everyone, and foreign players danced alongside Pakistanis to our national cricket anthems. The Chief Minister of Sindh, Murad Ali Shah, even made a round of the stadium, waving at the eager smiling faces waiting to watch history being made in Pakistan. The return of cricket to Karachi was thus quite the extravagant affair. Nevertheless, the experience was far from picture-perfect. From the hoard of mismanagement that took place inside National Stadium, the worst one was the zero supply of water at all the stalls. From Pizza Point and United King, to even Pepsi’s official stall, there was no bottled water; just coolers installed in certain enclosures. This was clearly terrible management, given the heat wave that came alongside the PSL final. My friends and I left my enclosure after the first inning, full of disappointment (being Zalmi fans), and instantly craved a cigarette. We weren’t the only ones. The atmosphere inside and outside the watching stands was thus of stark contrast. While people inside were concerned with the players, with gimmicks that would catch the camera’s attention, or with the overall significance of the day, the people outside were only concerned with one thing – their “sutta” (smoke). Honestly, it was quite surprising to see how quickly and drastically people reacted to the deprivation of tobacco. Forget saying ‘hi’ and catching up; all my old and new acquaintances – and even some people I had never met before – would come up to me, only to ask if I could somehow get them a ‘smoke’. On the rare occasion someone was lucky enough to find a cigarette – by borrowing one from the police officials or other security personnel – they would sprint in joy to one of the stalls and borrow a match to light it. Those who were not so lucky spent their time scanning the air around people, to see if they could smell or see the smoke from a cigarette. When a friend of mine was fortunate enough to find one, at least eight people came to ask him if he could spare a “kush”.